"Ideal Cabaret, the best cabaret and dinner shows in Paris and everywhere in France. 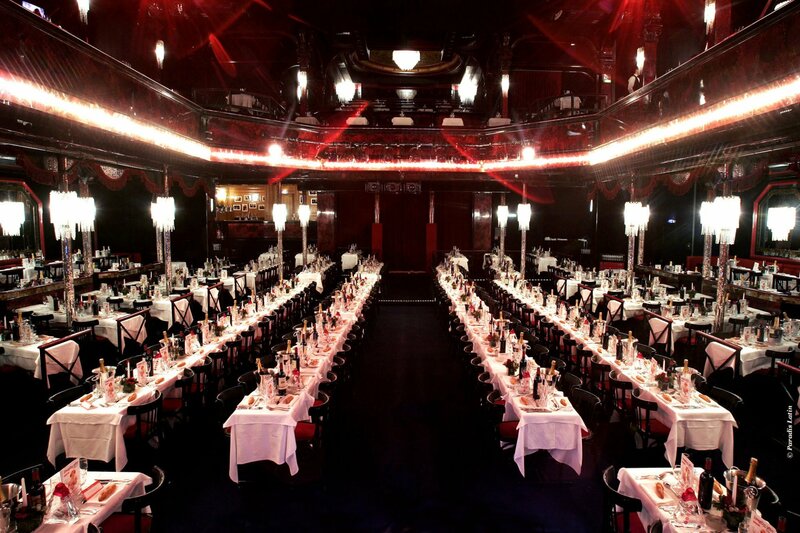 As a couple, in a groupe or with your company, take advantage of our exclusive offers"
This is the oldest cabaret in Paris, it was built at the same time as the tower by Gustave Eiffel, and now it is truly timeless, a registered historic site. Artists, professionals, those who love the place have given it back its true identity and you are about to experience a dazzling night in this Paradis Latin located in its very same Latin quarter. The Paradis à la Folie revue was launched in 2009. 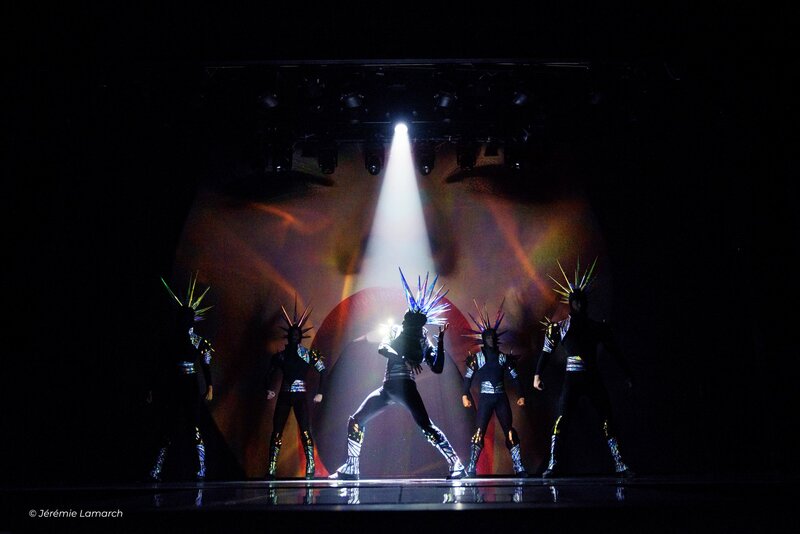 It is an ode to love in all its forms, the show takes the audience into the history of love, its legends and its future. It is a fireworks of ballet, grace and joie de vivre, really marked by French elegance: love in the années folles of the 20’s, the atmosphere in the cellars of St Germain des Prés right after the war, the liberated passions of the 70’s. Not forgetting of course the face of future Love… Those are just some of the tableaux presented here by an exceptional troupe of 25 young dancers, with world class shows. The cuisine at Paradis Latin is good, the service attentionate. All ingredients are here for you to have an excellent night, and it is really a good deal too. Welcome to … Paradise! The beginning of the mystical place In 1979, two years after the opening of Paris Paradis, Jean-Jacques Debout and Roger Dumas created Nuit de Paradis for Jean-Marie Rivière. In 1981, the new show Paradisiac is born and directed by Frédéric Botton and Francis Lai, who took a leave from his musical and film career for the project. A young and promising talent immerged at their side named Michel Berger! The artistic direction, Jean-Marie Rivière, retired to the Antilles, however “the show must go on” New shows followed, co-written and directed by Christian Dura: Champagne in 1984, then Hello Paradis in 1987, and Viva Paradis, which commemorates the hundredth anniversary of the theatre. In May 1995, a few years after the departure of his old accomplice Riviére, Jean Kriegel chooses to retire as well. In almost twenty years, the director had dazzled the eyes of 2 million spectators, with 6 shows and over 1600 unforgettable evening performances! Sidney Israel and his son Harold take over: and a new era begins for Le Paradis Latin. The renaissance 1973: Forty years later a new buyer shows interest. Jean Kriegel, a real estate developer, purchases the property occupying the buildings 28 and 28 bis rue du Cardinal Lemoine. He envisioned transforming the property into apartments. . Upon visiting the establishment, the new owner inspected room by room and to his surprise found eighteen thousand test tubes and Petri dishes. Vestiges of the former activity were present everywhere abandoned by the former owner. Even more surprising, upon the destruction of partitions and false ceilings, the impressive metal structure created by Eiffel was laid bare...! On its walls, shattered fragments of posters and pieces of scenery were scattered. Among them, the proud owner discovered a poster ... Paradis Latin (opposite side). On the first floor, workers found a stunning cathedral, with gilts and columns, arches and high top ceiling. But the most surprising was yet to come: a superb cupola hand painted to the glory of pantomime, the opera, ballet and eccentricities. Conquered by the magic of the places, Jean Kriegel decided to restore the hall for the glory of Paris, and to offer it the most beautifully adorned theater. 1977: The direction, production and artistic license is conferred on Jean-Marie Rivière. 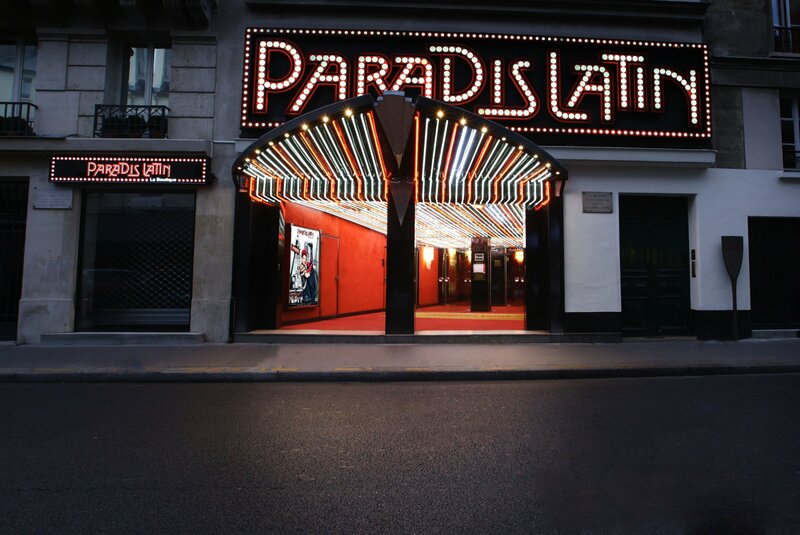 On the 14 November 1977, he introduced Paris Paradis, a poetic and burlesque show realized in the collaboration with Simonini and Frederic Pierre Botton. It was an unequivocal success. Le Paradis Latin reborn again from the ashes, and forever! The shows In 1979, two years after the opening of Paris Paradis, Jean-Jacques Debout and Roger Dumas created Nuit de Paradis for Jean-Marie Rivière. In 1981, the new show Paradisiac is born and directed by Frédéric Botton and Francis Lai, who took a leave from his musical and film career for the project. A young and promising talent immerged at their side named Michel Berger! The artistic direction, Jean-Marie Rivière, retired to the Antilles, however “the show must go on” New shows followed, co-written and directed by Christian Dura: Champagne in 1984, then Hello Paradis in 1987, and Viva Paradis, which commemorates the hundredth anniversary of the theatre. In May 1995, a few years after the departure of his old accomplice Riviére, Jean Kriegel chooses to retire as well. In almost twenty years, the director had dazzled the eyes of 2 million spectators, with 6 shows and over 1600 unforgettable evening performances! Sidney Israel and his son Harold take over: and a new era begins for Le Paradis Latin.